Windows VST, and OSX Audio Units, VST. So the Size Selector is surely the most important setting in EAReverb. This is more a Room-Builder-PlugIn than a common Reverb. The "Early Reflection Section" creates the main sound and the "Late Reverb Section" is for enhancing and supporting it. I produced demos with each Roomsize (from XXS to XXL) for showing how well EAReverb can create spatial rooms without a lot of reverb. So you will listen to depths - only produced by the "Early Reflection Section" and with different dry/wet ratios. (G.F. Handel: Watermusic, Bourée Nr.7). I tried to play the excerpt in several distances. I always used "Room L" (same test conditions as shown on the right). But, I added VSL's PowerPanner for making the farther signals (75% and 80%) a bit more mono (50% stereo) for getting a more natural result. EAReverb comes with some different factory presets. They could be better for showing the real qualities of this Reverb. 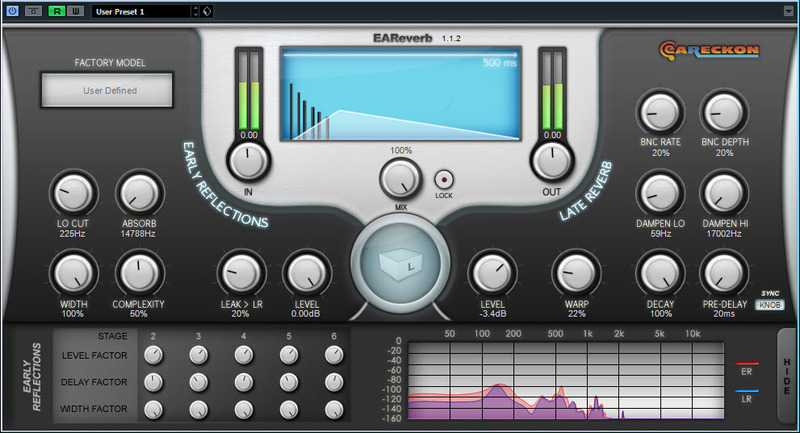 EAReverb is not able to produce Reverbs (with long Tails) as TSAR or BREEZE can do it. But it is a specialist for producing spatial depths without a lot of reverb. Listen to the demos: The depths sound good without the "Late Reverb Section" as well. As I mentioned above, the "Late-Reverb-Section" doesn't produce nice reverbs as BREEZE or TSAR. EAReverb seems to use only a little CPU-Power. Bravo!